Many communities have a ‘Parade of Homes’ where the local builders demonstrate their skills in building homes. Walking through these show homes will give you a good feel of what different ideas and concepts look like in actual settings. You can also see many different styles of kitchens and ideas on display in home improvement centers and cabinet makers’ showrooms. Pictures are great to find kitchen ideas, but experiencing real kitchens gives you a better feel for the actual finished concept. If you are remodeling your old kitchen, you may be somewhat limited in the design options available to you. This may be especially true if your house is older and your kitchen space is smaller. 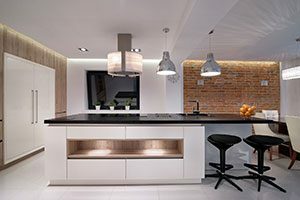 This is where consulting with a kitchen designer can be very beneficial in helping you pull together the look that you want for your kitchen. You can show the designer your portfolio of kitchen ideas, and together you can design your dream kitchen. The designer will have the experience to steer you toward the design features that will work well together, and which ideas need to be discarded. After seeing which kitchen ideas you prefer, a good designer will introduce you to ideas that you may not have considered to compliment your basic ideas. A kitchen designer will be able to maximize the efficiency of your kitchen by creating the best layout within your existing kitchen space, or maybe rework your available space to make your kitchen more functional. Getting ideas on remodeling your kitchen are all around you. Take the time to gather as many ideas as you can as a starting point in remodeling your kitchen, you can always sort out the kitchen ideas that don’t fit in your final design plan.